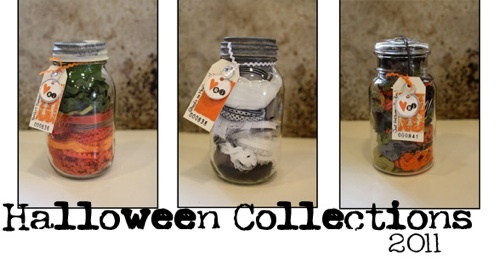 Halloween Jars & Projects at Ribbon Jar! We had such a great response with our Halloween Limited Edition Jars we made up a few more for those that weren't quick enough to get one. Here is a sample of the orange and black ribbon everyone is wanting this season for their Halloween projects. We have a very large selection of Ric-Rac, Satin, Herringbone and Pom-Pom trim just to name a few. The best way to shop for the color you are looking for is to Shop by Color! Simply move your cursor over the colored jar and click; all our ribbons of a particular color will show up. This morning I mentioned on Color Chic that I had a Halloween project I was going to start! In two short hours I put these two together. One a pillow cover with a pocket back using our pleated satin and 16mm black velvet. The other project was a pillowcase for my Granddaughter who asked "will you make me one too"! How could I resist! What projects are you working on this Halloween? Send us a photo of your projects and if we use them in our Newsletter you'll receive $15 towards your project! FREE SHIPPING Ribbon Jar has Free Shipping on Domestic orders over $100, *All Jars excluded in this offer. International orders exceeding $100 before shipping will be adjusted to reflect the value of free US shipping. Copyright © 2011 Ribbon Jar, All rights reserved.